Step 1 Soak the beans. To cold-soak them, cover with plenty of cold water and let them stand overnight. To hot-soak them, cover them with plenty of boiling water and let stand 1 hour. Step 2 Drain the beans and place them in a large saucepan. Add cold water to cover, season with 1 teaspoon salt and bring to a simmer. Continue to simmer until crisp-tender, 30 minutes to 1 hour (the timing can vary widely and will depend on the type and age of the beans), then drain the beans. Step 3Heat the oven to 350 degrees. Combine the olive oil, garlic and the onions in a baking dish and bake until the onions soften and turn golden, about 15 minutes. Add the beans to the onion mixture, stirring to coat, and return to the oven for 15 more minutes. Step 4Gently stir in the hot broth, parsley, dried red pepper flakes, chopped tomatoes, tomato paste, 1 teaspoon salt and one-eighth teaspoon pepper, or to taste, and bake until the beans are tender and buttery, 20 minutes to 1 hour, stirring every 20 minutes. If the mixture begins to dry out before the beans are tender, add a little more broth. Step 5Before serving, season to taste and add a squeeze of lemon juice. In Recipes-list.com we have selected the most viewed recipes from category - Healthy eating Main courses Sides Vegetarian . Enjoy the best recipes specially selected for you! 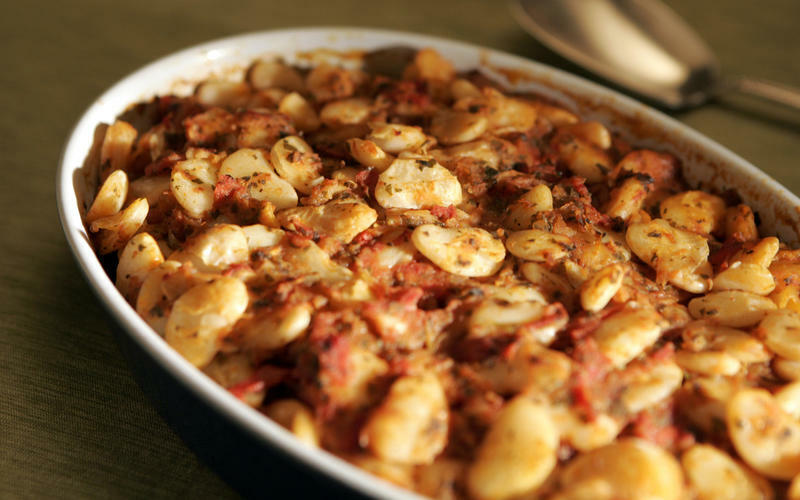 Baked gigantes (oven-baked white beans) is the right choice that will satisfy all your claims.